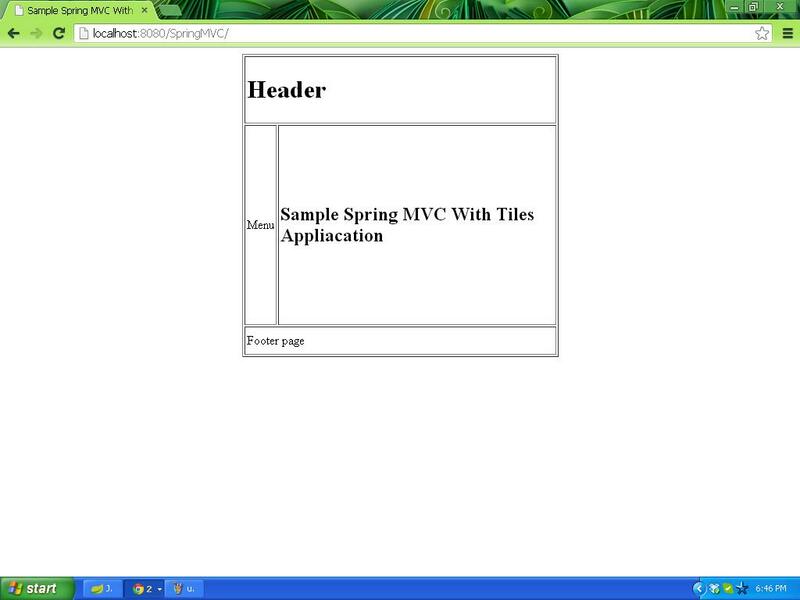 Below post talks about the Spring MVC integration with the tiles framework. You can build developer friendly and user friendly web applications using the tiles framework. 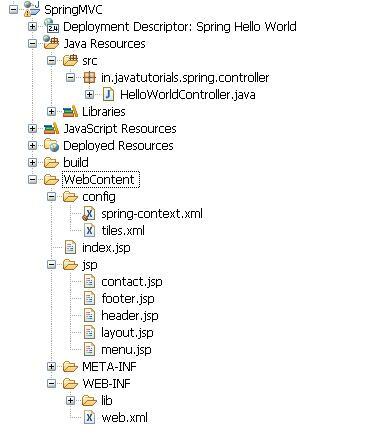 Below is the web.xml file which contains the spring configuration. DispatcherServlet is controller of the spring mvc application, all the requests which coming to the application will be passed through it. DispatcherServlet loads the spring-context.xml file during server start up and keeps the all the configurations in servlet context. Action path configured for this applications is *.html. index.jsp file configured in web.xml as a welcome file, so this file will be loaded when user hit the http://localhost:8080/SpringMVC/ url in the browser. When ever index.jsp loaded into the browser, it will forward the request to contacts.html. This contacts request is mapped to contollContacts() method in HelloWorldController class. So, contollContacts() method will be executed and it will return the ‘contact’ string after completion of method execution. As the Tiles framework has been configured in the spring-context file as below with UrlBasedViewResolver, whenever contact will be returned by contollContacts() methods, request will be reached to tiles.xml and contact tile configuration will be loaded. Below will be the tiles configuration made for our sample application. contact tiles definition is extending to base.definition and base definition will be using layout.jsp as the layout file for our application. This layout.jsp is divided the complete application page as header, menu, body, footer. So, once the layout.jsp called, all the other jsps will be included as per the configuration mentioned in the tiles.xml file. When ever user hits the below url in the browser, application will be loaded as mentioned in the below screenshot. How dispatchServlet will know that a particular view should be resolved with a particular resolver? eg. I am using two resolvers InternalResourceViewResolver or TilesViewResolver? Now, I returned some view name that was supposed to resolved with TilesViewResolver but it got resolved with InternalResourceViewResolver and it tried to find that jsp. Whereas, actual jsp name should come after consulting TilesViewResolver! What’s wrong here? I am using plain JSPs also that doesn’t have anything to do with Tiles. Should I use only plain JSPs or Tiles only? Please explain. Let me know if you have any query. Getting the below exception. Here Dispatcher servlet is calling InterviewViewResolver instead of TilesViewResolver? May be because of this attribute’ title’ is not visible there. org.apache.tiles.template.NoSuchAttributeException: Attribute ‘title’ not found. When u are using two resolvers it is better to use different attributes fr both the resolvers to avoidcnfusion. I coulnt understand why u need use above mentioned two view resolvers using both we can achieve similer kind of output. Can u let me knw, wht is the exact reason to cnfigure abve resolvers in a single application ? Thanks. I solved it by specifying ORDER attribute on resolvers. Since I am newbie, so I created sample application with these resolvers.But I didn’t get one point above. How you can get similar kind of result using both resolvers? Both resolvers are different, isn’t it?